New York sent more soldiers to fight in World War I than any other state in the Union. In fact, New Yorkers represented more than 10 percent of U.S. troops. 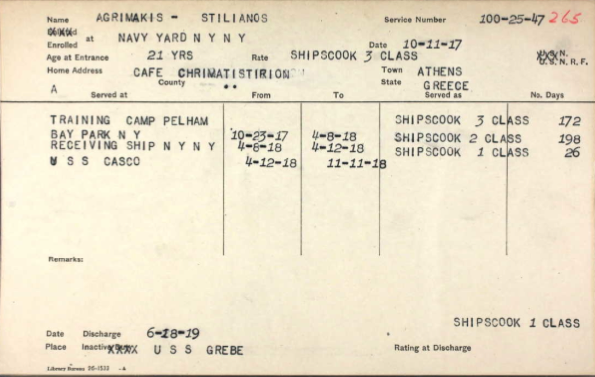 This collection includes cards listing details abstracted from federal military service records for Army officers, enlisted men, sailors, Marines, and nurses who enlisted or were drafted in New York. The majority of the records begin in 1914 and continue through 1919. Because the service records for most World War I Army veterans were destroyed in a 1973 fire at the National Personnel Records Center of the National Archives, this collection is a particularly important resource. This collection does includes some women who served as Army nurses or Navy yeomen (women working in secretarial and clerical jobs) or nurses. These cards were created in 1920. Because these records are abstracts, there is a possibility that errors crept in during the transcription process. According to the New York State Archives catalog, some errors were noted and corrected in 1935, so you may see notations that were written in after the initial extraction.